When comic book enthusiasts discuss the golden age of comics they generally are referring to superhero comics from before and during World War II. While it is not clear, at least to me, whether there was a real connection between the war and the popularity of superheroes, there is little doubt of the relationship of the patriotic heroes and the war. 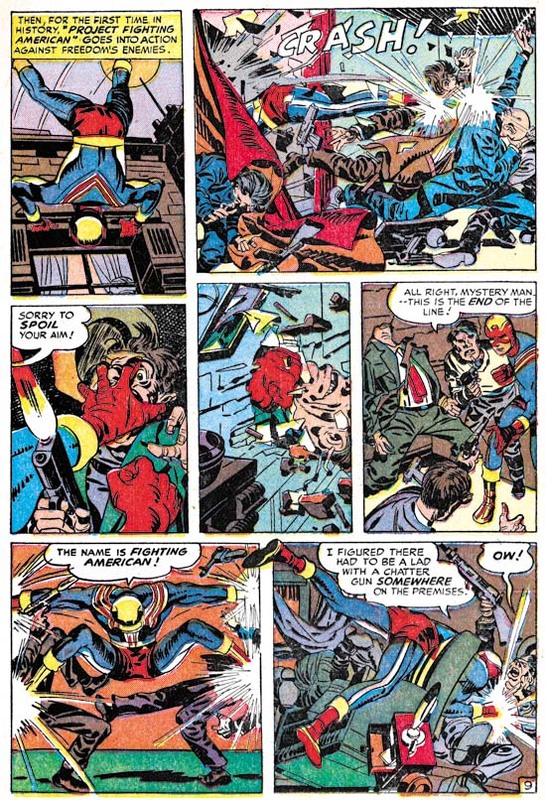 Simon and Kirby did not create the first patriotic hero (that honors went to Irving Novick’s Shield) but their Captain America was such a mega-hit that it spawned a multitude of imitations. Joe and Jack only did ten issues of Captain America but what they did was so dynamic and imaginative that superhero comics were never the same. 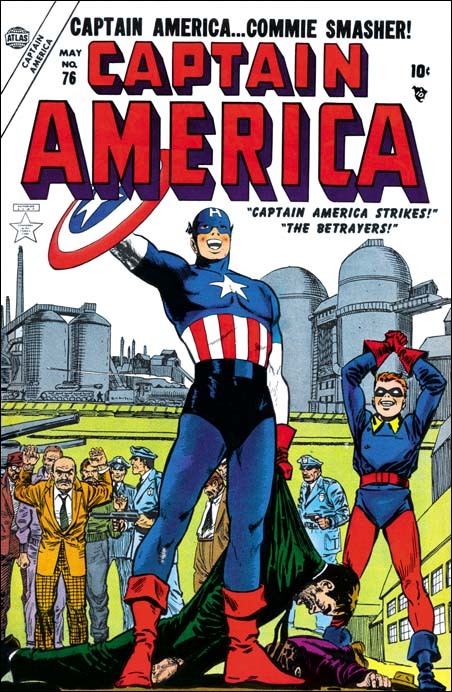 Simon and Kirby’s issues of Captain America were all done before America had entered the war but with Adolf Hitler on the covers of the first two issues there was little doubt as to who the enemy truly was. While most other superheroes had been battling criminals Captain America fought against spies and saboteurs. After the war ended superheroes declined in popularity as other genres (in particular crime, horror and romance) became the big sellers. America was officially at peace but it was not long before tensions developed with our previous ally Russia. Tensions that became so serious that it was to be called the Cold War. The chill became particularly deep when America lost China to the Communists. Never mind that China was never America’s to lose or that the side America backed was corrupt while the Communists were popular among the Chinese population. Those explanations were considered inadequate by many Americans who felt someone was to blame. It was an all too small step from placing the blame on incompetence to declaring it was deliberate. Joe McCarthy would lead a crusade against all the communists that he said had infiltrated the U.S. government. It would not have been hard to draw the parallels between America prior to WWII and that in the midst of the Cold War. If superheroes were popular then maybe the time had come to reintroduce them. Perhaps this was the logic behind the Atlas re-launched of the Human Torch, Sub-Mariner and Captain America in Young Men #24 (December 1953). Did Simon and Kirby make the same comparison between the Axis and the Communist treats? Or did they notice the return of Captain America to the comic book racks? The timing is just possible as it takes three to four months to produce a comic and so the earliest cover date following YM #24 appearance would be March or April 1954. 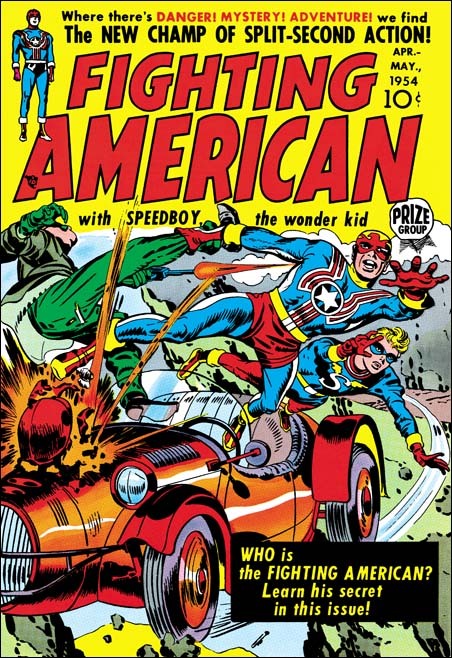 April is exactly the date that appears on the cover of Fighting American #1. 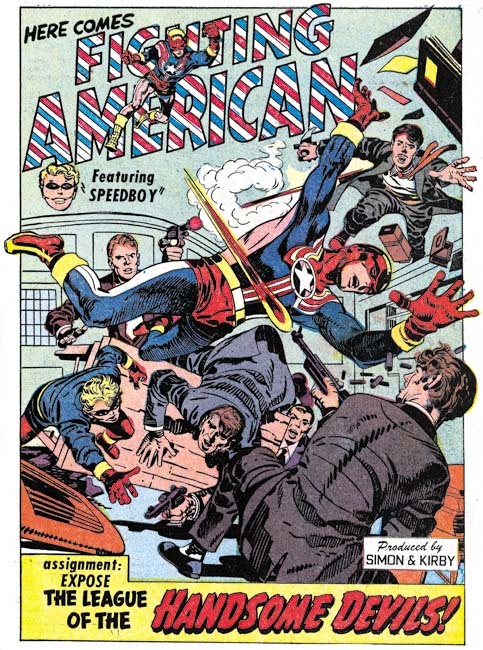 Even if Simon and Kirby were not aware of the Atlas superhero revival they were well aware that nobody did Captain America better then they did and they would use the Fighting American to prove it. 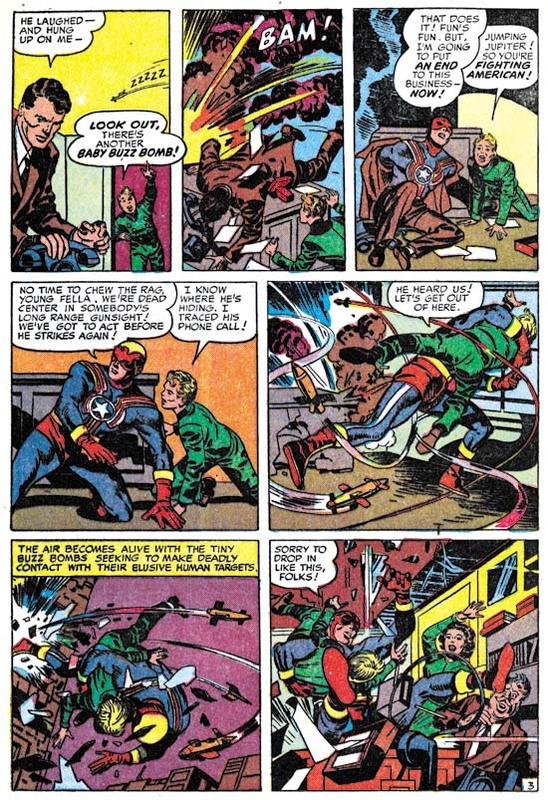 The origin story of Captain America seems little more then something for Simon and Kirby to get quickly past before going on to the stories they really wanted to tell. The origin of the Fighting American is told in only a couple of more pages but it is a much more interesting read. It is not the method that provides the two heroes with their powers is all that different it is the circumstances surrounding them. Before Captain America gets his powers we are shown suffer the humiliation of being a 4F. But that pales before what physical humiliation that the pre-Fighting American endures. 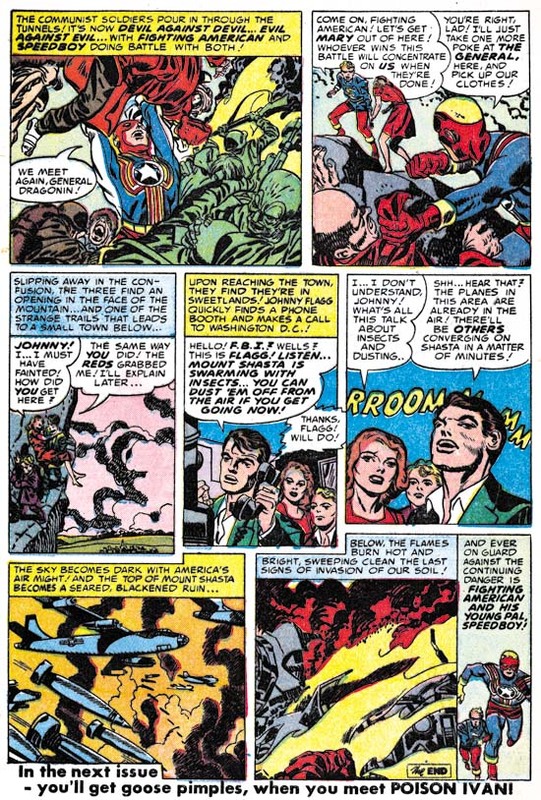 The action in the Simon and Kirby Captain America may have been unlike anything seen in other comics in those days but by the time Fighting American came out Jack Kirby had taken action to a new, much higher, level. While in the origin story Captain America got to use his new powers against a single spy, the Fighting American takes on a roomful of armed opponents. I love the way Fighting American’s punches his opponent through the wall and leaves him hanging there! Even the patriotic hero’s sidekick got upgraded. Bucky became Cap’s partner by doing nothing more then discovering his secret identity at the end of the origin story. Simon and Kirby would devote an entire story, “Baby Buzz Bombs”, for the introduction of Speedboy. Yes Speedboy finds out the Fighting American’s alter ego but he also manages to save FA’s life more then once. 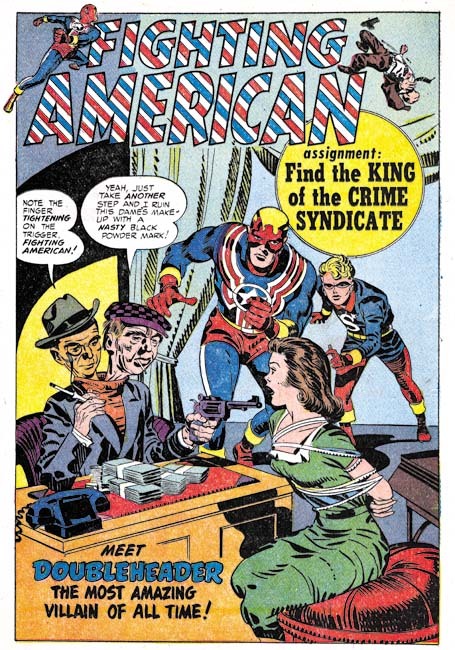 Communist spies were the villains for all three stories in the first issue of Fighting American, but with the second issue criminals were also fought. Was the shift from spies to criminals on purpose or were Simon and Kirby just trying to keep variety in the stories? Okay I do not have anything more to say about Fighting American confrontations with the criminal element. But I just love these two stories and wanted to include images of the great splash pages. All of the original art for “The League of the Handsome Devils” was included in Mark Evanier’s “Kirby: King of Comics”. A newly restored “Find the King of the Crime Syndicate” will be appearing in Titan’s “The Best of Simon and Kirby” which hopefully will be out in May. Even in the story from FA #2 with Communist spies as villains, Simon and Kirby would throw in a horde of ghouls. It is hard to escape the conclusion that in the end the Communists were not seen as quite the foes for the Fighting American that the Axis powers had been for Captain America. Note the drawing of the Fighting American rising above the fight and just about to hurl an opponent. It is just one among many great panels but it would have a lasting impact. It would be swiped by Mort Meskin for a cover for Tom Corbett Space Cadet #2 (July 1955) the only example of Meskin lifting from Kirby that I am aware of. Years later Jim Steranko would use the design for a splash page in Captain America #113 (May 1969). Simon and Kirby followed their standard modus operandi when producing the initial issues for Fighting American. That is Jack Kirby provided all the artwork for the Fighting American stories. New anthology comics might get some help from other studio artists but with titles for a new feature, like Fighting American or Boys’ Ranch, Kirby would invariably do all the important art in the first issues. I consider the art from this period to be the best that Simon and Kirby did. I am not talking about the pencils because Jack Kirby never stopped pushing his art in new directions. Kirby fans invariably favor one period of Jack’s art but just as invariably they do not agree what period that was. What makes this particular period so appealing to me really is the inking. The Studio Style inking was at its peak and, with its combination of subtlety and boldness. It was the best inking ever applied to Kirby pencils (although Jack would later do some real nice work using the Austere Style). Some of the inking for these first two issues of Fighting American looks like it was done by Kirby himself. Kirby had been inked by some great inkers during his career but there is always something special when he inked his own pencils. But do not use the Marvel Fighting American reprint to judge. Some of it was restored from chemically bleached pages but alas some of it was done by inking on tracing paper. Hopefully Titan will be publishing a newly restored version of Fighting American in the not too distant future. The first two issues of Fighting American were just spectacular. Nobody could do this type of action hero better then Simon and Kirby. Not only that, but their Fighting American was far in advance of what they had done years before on Captain America. Comparing these two issues of Fighting American with the contemporary version of Captain America being published by Atlas… well you just cannot compare them the Atlas Captain America seems so weak in story and art. It would appear that Simon and Kirby had set the tone for some exciting Fighting American issues to come. But wait, there at the bottom of the last page (see image above) “In the next issue – you’ll get goose pimples, when you meet POISON IVAN”. Could anyone take a villain named Poison Ivan seriously? On a different point. Are you aware that Alan Hotz has one Gross/Simon True sunday up on his Stripe’s Guide website? He may have more privately. I’d love to see you take a look at those as they represent some of the latest work Joe did without Jack Kirby. What can I say, so much Simon and Kirby and so little time. Yes I saw Hotz’s post of the Simon/Gross True syndication strip but I am already involved in more projects then I have time for. Hopefully someday I will find the time to give True Comics the investigation it deserves. Big fan of anything Kirby especially Fighting American, so im really enjoying this. Just one thing, i am also a huge Mort Meskin fan , and let me assure you Meskin obviously had no need to copy art from other artists, in fact im comparing the Tom Corbet cover with that panel, and aside from being a character in a fight with many enemies lifting one above his head the art has nothing to do with Kirby’s. It’s just a very common way to illustrate a fight, often also used by Frank Frazetta. It is not that Meskin copied, it is that Meskin was influenced by Kirby’s drawing. This sort of thing happens all the time. And lifting an enemy to throw him was not very common in comic book art so to see it used by two artists working in the same studio in such short succession leaves little doubt in my mind that one picked it up from the other.